Oregon’s flora and fauna face a no-analog future climate, a climate where environments are changing faster than many species have ever experienced. If we maintain business as usual, then by 2100, the average annual temperature of the Pacific Northwest will rise by at least 6 °F due to increasing greenhouse gasses. Climate models disagree on future average annual rainfall in the Pacific Northwest, but most predict lower average summer rainfall by the end of this century. Thus drier and hotter growing seasons are projected for many of Oregon’s native species, of which rare plants and their dependents may be at most risk from this rapid climatic shift. Flowering capitulum of Snake River goldenweed (Pyrrocoma radiata). Photo credits to Tom Kaye. IAE ecologists Ian Pfingsten and Tom Kaye are currently assessing the potential impact of changing climates on seven rare Oregon natives (six plant species and one butterfly species) by identifying which aspects of the climate appear to control the populations of these species. This approach uses Climate Driven Population Models. More precisely, they’re looking for climate drivers that affect the rate of growth, survival and fertility of the organisms they’re studying, and then linking these climate variables to population models. This allows them to project these species population sizes into two possible futures: one with a changing (forecast) climate and one with a stable (observed) climate. Total spring (May-June) evapotranspiration at Pyrrocoma radiata populations. The black line represents actual values from 1979-2012 and the colored lines represent forecasts from seven general circulation models (CMIP5) from 1950-2100 based on the worst-case carbon emission scenario (RCP 8.5). The dashed line is the average of the observed period. They’re finding that growing season evapotranspiration (rate of water loss through evaporation and plant transpiration), which increases with temperature, strongly correlates with many species’ population changes. Unfortunately for these endangered species, evapotranspiration is forecasted to increase as future temperatures rise, and that may push some species to extinction faster than predicted under stable climates. Even populations that are expected to increase under stable climates are projected to decrease with higher average summer evapotranspiration. The species currently being examined include Tygh Valley milkvetch, Snake River goldenweed, Green’s mariposa lily, shaggy horkelia, Bradshaw’s lomatium, Cook’s lomatium, and Fender’s blue butterfly. 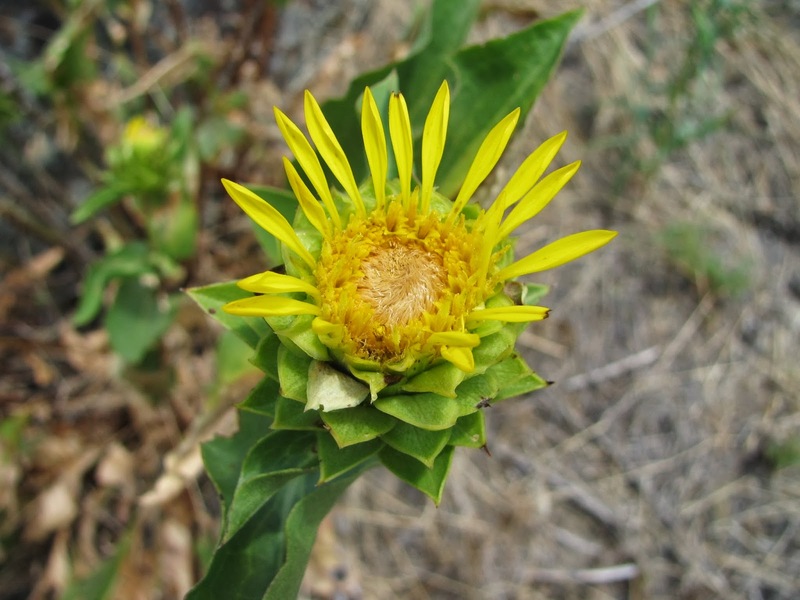 An example of a plant species at increased risk due to climate change is the state-listed endangered Snake River goldenweed (Pyrrocoma radiata), which is located along the border of Oregon and Idaho where climate is more arid than in the Willamette Valley. Preliminary findings from this approach show that spring evapotranspiration is negatively associated with plant growth and survival, but positively associated with plant fertility, which denotes a trade-off between growth and reproduction. 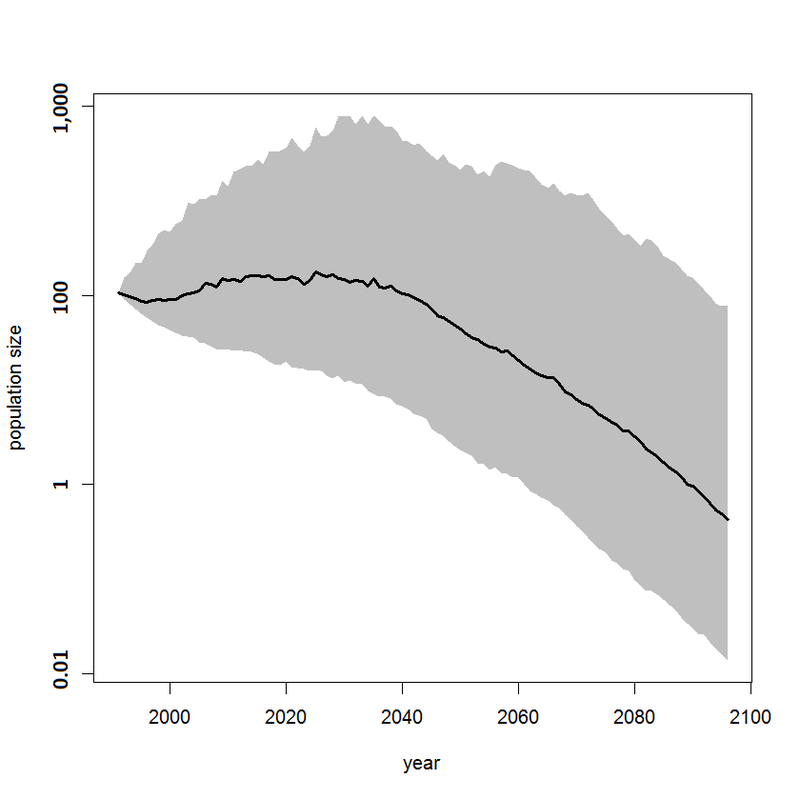 Preliminary findings with future simulations into 2100 project faster population declines under climate change than under stable climate at all of our study sites. Of particular importance in the rangeland habitat the species occupies, the populations seem to fare better under climate change when excluded from large mammal herbivory, suggesting an interaction between climate change and disturbance. Pyrrocoma radiata population simulated from 1991-2100 using climate forecasts of seven general circulation models. The solid black line is the median (50th percentile) and the shaded region contains 95% of the simulations (2.5th – 97.5th percentiles). Pfingsten and Kaye are currently completing climate change impact analyses for these species and will present their findings in upcoming reports and publications. This project is supported by the Bureau of Land Management and we're grateful for their support. Wondering about your claim that by "2100 the average annual temperature of the (PNW) will rise by at least 6F...". With a high degree of variation present in all current climate models, presenting a range of possible future temperatures (some lower than the 6F cited, others higher), I find this article's certain claim of an increase of "at least" 6F suspect. Source? Based on the variation(s) presented by various computer climate models, the actual rise could be significantly less (or more) than this...nowhere can I find support of the notion of "at least" 6F: this demonstrates a degree of certainty that even the modelers themselves do not hold. I apologize for the lack of sources. I will see if I can get them posted. The SRES A2 scenario is a lower radiative forcing scenario than the RCP 8.5 scenario from the newer CMIP5 climate models. Plus, A2 is considered a conservative scenario because our observed emissions are surpassing its projected emissions. Thanks for this Ian, much appreciated.